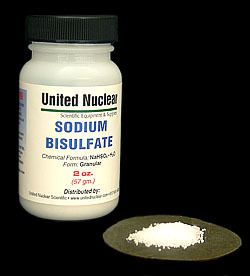 Sodium Bisulfate is frequently used as a replacement for Sulfuric Acid in many applications. Since Sulfuric Acid is prohibitively expensive to ship, Sodium Bisulfate is a popular substitute that can be shipped with no problem. Dissolving it in water will produce a reasonably strong acid that is useful in a wide variety of experiments that call for Sulfuric Acid.